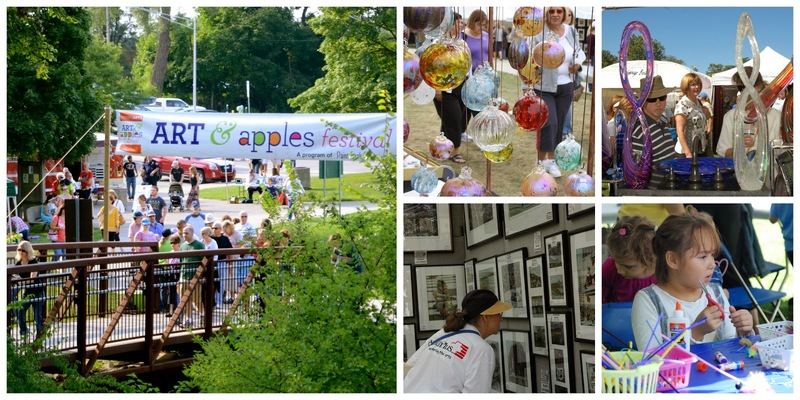 The 49th annual Art & Apples Festival was recently voted #14 out of 2,000 festivals in the nation by Sunshine Artist Magazine. The festival welcomes over 290 artists from 33 states and two countries and includes stunning fine arts, family activities, live entertainment, and three food courts. · ARTISTS – Over 290 artists will showcase their fine art in a variety of mediums – textiles, watercolor, woodworking, glass, pottery, jewelry and more. This year, one third of the artists are new to the Art & Apples Festival. · KIDS STUFF – Kids and families can enjoy a variety of FREE activities in the Meijer sponsored Kids Art Zone including “make and take” art projects from Paint Creek Center for the Arts and the Detroit Institute of Arts, a life-size art maze, crafts and activities provided by Metro Parent Magazine and a rock climbing wall and inflatables provided by Oakland County Parks and Recreation. · 8th Annual Pie & Dessert Contest – Finalists will be asked to bake an apple pie or specialty apple dessert for Saturday, September 6th at 11:00am. Guest judges include: Rochester Hills Mayor Bryan Barnett; Rochester Mayor Jeff Cuthbertson; Oakland County Executive, L. Brooks Patterson; FOX2 Personalities Taryn Asher and Jason Carr; and Miss Oakland County Teen 2014, Kristin Penrose. · FOOD - Three food courts will feed hungry festival-goers. New fare this year includes polish cuisine and barbeque goodies along with all of the familiar favorites and of course, apple pies. · ENTERTAINMENT- Entertainment will feature both local and national acts including Rochester-area high school bands. The event also features the Oakland University Acoustic Stage.